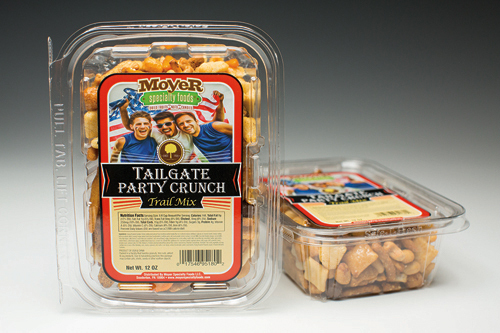 Ready for a tailgate party? This blend will give you the sweet and salty taste you are looking for in a snack to celebrate or just enjoy while rooting your favorite team to victory. Ingredients: Honey Roasted Sesame Sticks (unbleached wheat flour [contains malted barley flour as a natural enzyme additive], soybean oil, sesame seeds, honey coating [sucrose wheat starch, honey], bulgur wheat, tack blend [maltodextrin, xanthan gum], salt, beet powder [color], turmeric [color]), Milk Chocolate Raisins ([sugar, cocoa butter, chocolate liquor, milk, lactose, soy lecithin (an emulsifier), salt, natural flavor], sugar, palm kernel oil, cocoa, whey, nonfat milk, soy lecithin [an emulsifier], water, gum arabic, natural flavor, confectioners glaze, modified starch [tapioca], coconut oil), Oriental Rice (glutinous rice, soy sauce [water, soybean, wheat, salt], sugar, chili, seaweed, black sesame seed, caramel color, US FD&C Yellow 6), Pretzels (enriched wheat flour [wheat flour, niacin, reduced iron, thiamine mononitrate, riboflavin, folic acid], vegetable oil [may contain one or more of the following: corn, canola, soybean], salt, malt or corn syrup, sodium bicarbonate, yeast, enrichment), Honey Roasted Peanuts (sugar), Roasted Almonds, Cashews. Nutrition Facts Serving Size: 1/4 Cup Amount Per Serving: Calories 144, Total Fat 8g (12% DV), Sat. Fat 1g (5% DV), Trans Fat 0mg (0% DV), Cholest. 0mg (0% DV), Sodium 250mg (10% DV), Total Carb. 15g (5% DV), Fiber 1g (4% DV), Sugars 3g, Protein 4g, Vitamin A (0% DV), Vitamin C (0% DV), Calcium (4% DV), Iron (6% DV). Percent Daily Values (DV) are based on a 2,000 calorie diet.